This is well into Prince George's County in the area known as 'BARC', short for Beltsville Agricultural Research Center. 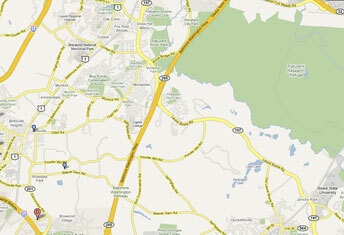 The region is bounded to the north by Maryland Route 197 which runs west into Laurel and east to Bowie. To the south by Old Gunpowder Road that traverses BARC from east to west. Route 1 borders the west running north to south, and Interstate 95 is another couple of miles to the west. And to the east by the Baltimore-Washington Parkway. Developments to the north include less congested areas of east Laurel and Montpelier, with established moderate density residential developments. 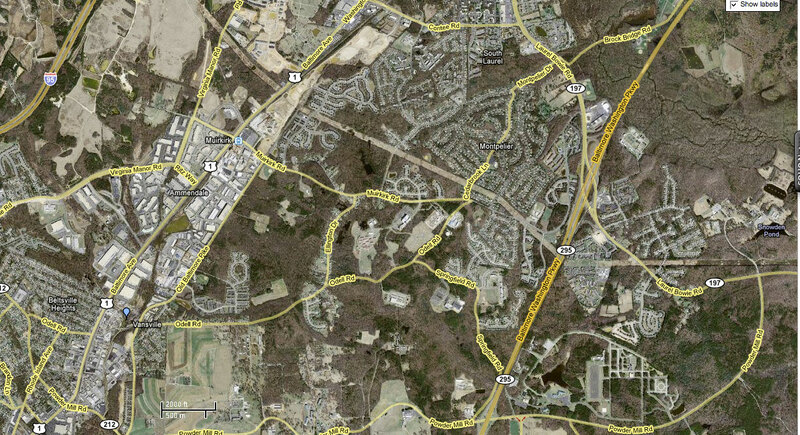 Large areas are US Government property and well out of reach of Developers, these include the USDA Beltsville Agricultural Research Center to south and west, to the east by US Secret Service training academy and US Patuxent Wildlife Refuge, and the area contains Capitol College. This area is also very close to NASA Goddard Space Flight Center and so some cooperation with NASA or its club might be possible. This area would be very convenient to the schools of Prince George's County centered in the Beltsville, Laurel, and Greenbelt area. PROS: Convenience, convenience, conevinience. With easy access for several schools in this area from Route 1 (the old north-south artery of the East Coast and in this area named 'Washington Boulevard'), Maryland Route 197 to the north, and from the Baltimore-Washington Parkway. This area provides several of the high vantage points and some areas have with surprisingly little sky glow (especially on clear winter nights) owing to the distance and lack of tall buildings in the area. The Observatory Dome helps to reduce the impact of any nearby lights that might otherwise distract. Even with the sky glow from the developed surroundings to the west from Beltsville along Route 1, the topography and atmospheric qualities of the area lend themselves well to high magnification observing with some exceptional nights throughout the year. Viewing a planet from this area can be better than most locations is dark but mountainous areas (Colorado, etc.). The area is as fully congested and developed as it is likely to be for the foreseeable future. Being a not too congested primarily government area, the infrastructure is good with choices of high speed Internet access in place by Comcast Cable, and coming gradually by Verizon Fiber Optic. This area of Prince George's County has several schools also that could benefit from this location including private and public schools that we have worked with in the past. This region is only four or five miles drive from Company Seven's current location. 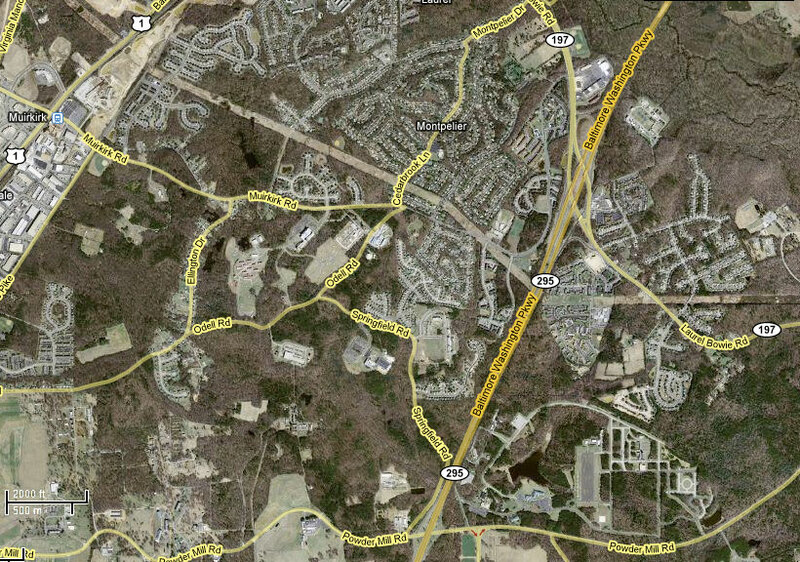 So while we would still be close to major highways, locating in this are could make us even more accessible by mass transit visitors owing to the closer proximity to the Greenbelt Metro station, the Murikirk Rail Terminal off Route 1 in north Beltsville; this assumes one can find a taxi in this area of Prince George's County. CONS: At first glance this entire area does not seem like an appropriate location for an Observatory. However, we suggest doubters to look to Griffith Observatory in Los Angeles, California to see an example of how such a center can operate symbiotically in a metropolitan area - and in this area we have US Government lands as a buffer against future development. In a business district "anything goes" is possible. If we owned only a small parcel of land (3 to 5 acres), then a neighbor could build a Mall or a tall building alongside and obscure our views. Again with the Government land, and lack of tall buildings on their properties then this should not be a concern. We were preferring to locate in the more rural areas of southern Howard County so that we could serve the tri-county district. However, the availability of undeveloped land is limited and the cost of it in this area is high since developers eye every acre for subdivision, even as actual land and home selling prices continue to decline. Traffic in the area is about at the breaking point with the Baltimore-Washington Parkway turning into a parking lot for northbound rush hour traffic, Route 1 congested likewise - and with any heavy rain often becoming impassible in places - that should not affect our observing however. Above: Aerial view of the BARC region. Company Seven's current shop location is west of Laurel-Bowie Road in an area beyond the map north of Contee Rd.